Baby Magic Calming Baby Bath - 887 ml | Multicolour | Easy-rinsing, tear-free formula designed to help soothe and relax your baby. Take great care of your baby's skin by using this calming body wash. Easy-rinsing and tear-free formula help soothe and relax your baby. It features pure lavender and chamomile extracts. 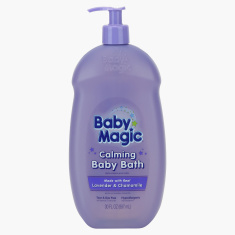 Feature 1 : Easy-rinsing, tear-free formula designed to help soothe and relax your baby. Feature 2 : Perfect before bed time and nap time, this gentle baby bath product is one of the only products in the market containing pure lavender and chamomile extracts.